How much do Cubs suites cost? Chicago Cubs suite rentals cost between $8,000-$15,000 for most regular season games. Pricing will vary based on opponent, day of the week, suite size and suite location. Rivalry games against the St. Louis Cardinals are priced at a premium, as are weekday games taking place on Tuesday, Wednesday, or Thursday. Experience Cubs baseball from a Wrigley Rooftop overlooking Wrigley Field. This is a VIP experience that most venues don't offer. Food and drinks are included inside an exclusive club located in the building. Open seating is facing Wrigley Field. Private restrooms are also located in the club. This is a great option for larger groups. Experience Wrigley Field from a private luxury box. Chicago Cubs suites include VIP parking passes, a premium food and beverage package (optional) and on-site concierge service. Cubs boxes also come with comfortable indoor and outdoor seating, a climate controlled environment and HDTV's. Suites at Wrigley Field vary in size and configuration. Traditional private luxury boxes are located on the Mezzanine Level wrapping around the infield between first base and third base. These traditional suites will accommodate groups of 14-24 with a mix of outdoor seating and climate-controlled indoor seating. Larger party spaces located in the outfield can accommodate groups up to 150. Wrigley Field Rooftops offer another unique semi-private premium option for larger group outings of 100+ guests – these are located across the street in the outfield. For regular season baseball games, Cubs suites are usually priced between $8,000-$15,000. Pricing will vary based on opponent, day of the week, and suite size/location. In-suite catering is available for all suites at Wrigley Field. The menu includes a wide range of food and beverage options provided by Levy Restaurants. Most suites at Wrigley Field do not include catering in the base price of the suite, so be sure to allocate additional funds. On average, SEG clients spend $100 per guest on a full spread of in-suite catering. However, there is no catering minimum. There is limited space for meetings and conferences on gameday. Some guests choose to give a short presentation in their suite before the game. You can connect a laptop to the TVs in the suite via HDMI cable. There is no dress code for suite level at Wrigley Field. All luxury suites at Wrigley Field are climate controlled. All bags, purses, and containers are subject to inspection prior to entry and should not exceed 16 x 16 x 8 inches. Read the full policy here. Children 2 and under will not require a ticket, provided they are seated on the lap of a parent or guardian. All suites ticketholders will have access to their suites 2 hours prior to first pitch. The Premier Entrance is located behind home plate on Clark Street. Thanks to the star caliber talent filling the 2019 Chicago Cubs roster, the NL Central is theirs for the having. The Cubs have one of the most talented teams in baseball and are eager to improve upon last season. Manager Joe Madden has the perfect combination of veteran leaders and young promising players throughout his lineup. The starting lineup will include Kris Bryant, Anthony Rizzo, Javier Baez, Jason Heyward, Willson Contreras and Kyle Schwarber. The depth of the Cubs is what sets them apart from many other teams in the National League, so having players like Ian Happ, Ben Zobrist and Albert Almora Jr. only makes them stronger off the bench. Baez is fresh off a career year and Bryant is over his injury filled 2018 season. With Rizzo and Schwarber’s power, this Cubs lineup is a force to be reckoned with. As good as this lineup is, the Cubs’ pitching staff could be even better. Led by Jon Jester, the Cubs have essentially four aces in their rotation. Kyle Hendricks, Cole Hamels and Yu Darvish are all capable of picking up the ball on opening day for any team. Brandon Morrow and Pedro Strop will anchor the bullpen. With suites and rooftop experiences, Cubs fans can experience VIP treatment in multiple ways at Wrigley Field. Private suites at Wrigley Field are located on the Mezzanine Level along both baselines. A Cubs suite can accommodate 14 – 18 guests and can be fully catered in advance to your game. With a suite ticket, guests enter Wrigley Field through a private entrance and will have exclusive access to the suite level. The Cubs suite experience begins two hours prior to first pitch, allowing fans to catch batting practice. Have a bigger group than a Cubs suite can hold? No problem. Across the street are the famous Wrigley Rooftops. This all-inclusive experience provides fans a view of the game no other stadium in baseball offers. Wrigley Rooftops have open bleacher seating on top of the building with a club experience inside featuring buffets and bars. Every rooftop will have private restrooms, HDVTs and guest list entry. From a suite or a rooftop at Wrigley, experience one of baseball’s most iconic venues this season. The Chicago Cubs have made the postseason three consecutive years for the first time in over 100 years, making this stretch one of the greatest in the history of the franchise. After breaking the 108-year championship drought by winning the World Series in 2016, the Cubs fell short in the National League Championship Series in 2017. This season the Cubs will look to get past last year’s championship hangover and return to their World Series dominance. Sluggers Anthony Rizzo and Kris Bryant remain the heart and soul of this team. Together Rizzo and Bryant are not only a formidable force in the lineup, but great leaders in the clubhouse and the Chicago community. Watching these two superstars turn one of sports’ lovable losers into a championship team has been a true pleasure for all sports fans. Addison Russell and Javy Baez round out the infield with home run pop at the plate and elite defense in the field. In the outfield, five-time Gold Glove winner Jason Heyward will look to continue his defensive wizardry in right field. He’s joined by Kyle Schwarber, who will look to have a bounceback year, and the always versatile Ben Zobrist. When everything is clicking, Chicago’s lineup remains one of the most dangerous in the majors. The starting rotation will take a slight hit due to the loss of Jake Arrieta, but Kyle Hendricks, Jon Lester, and Jose Quintana should make up for the loss. Manager Joe Maddon is one of the most entertaining and quirky, yet talented, managers in the league, and he will look to lead the Cubbies deep into October once again. Expect another great year of baseball on the North Side of Chicago in 2018. Perhaps the most iconic stadium in baseball, Wrigley Field has a number of premium seating options. 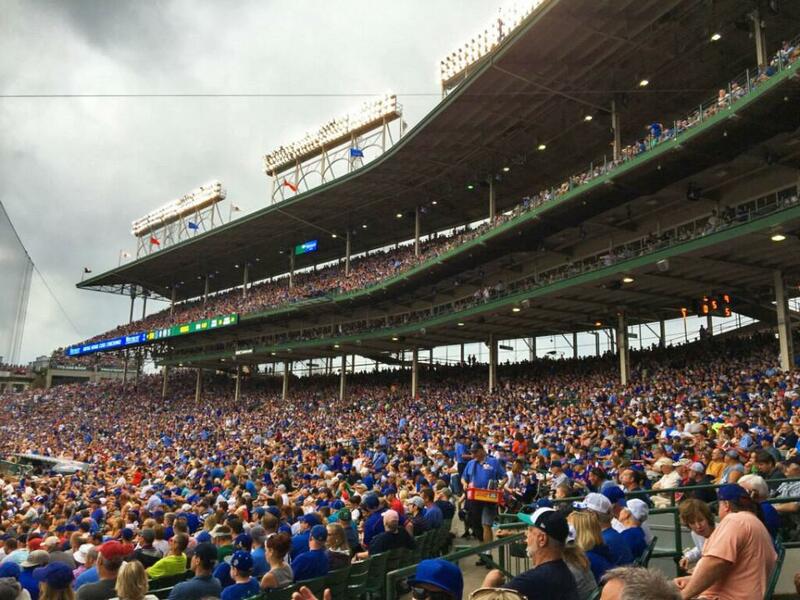 Whether you’re treating valued clients or going to the game with friends and family, Wrigley Field is nothing short of an incredible experience. Luxury suites include in-suite catering options, climate controlled indoor space, HDTV's and a dedicated suite attendant. Your luxury box allows guests to enjoy comfortable seating both inside and outside your suite. Wrigley Rooftop premium seating represents an alternative to traditional suites. Situated on the rooftops of buildings surrounding the outfield, Wrigley Rooftops are quickly becoming an iconic way to experience a Cubs game. Wrigley Rooftop options includes club space, catering, private restrooms and bleacher seating. Don’t miss out on one of the most unique viewing experiences in all of sports. The Chicago Cubs enter the 2017 season as World Series Champions; their first since 1908. The Cubs are returning a team loaded with offense and pitching. The Cubs are strong favorites to win the NL Central and return to the World Series. Reigning NL MVP Kris Bryant will anchor the middle of the Cubs batting order along with first baseman, Anthony Rizzo. Chicago's lineup will be boosted by the presence of a heathly Kyle Schwarber. Schwarber missed most of 2016 due to injury, returning to make an impact in the World Series. Expect the ascension of shortstop Addison Russell to continue; Russell has a great glove and his offensive approach is maturing. Outfielder Willson Contreras provides solid upside and RF Jayson Heyward looks to bounce back after a tough first season with the Cubs. Veteran Ben Zobrist is a key leader for this team. He's a proven winner and comes to play every day. Entering 2017, the Cubs' rotation looks just as potent as it's offense. Leading the rotation will be Jon Lester, Jake Arrieta and Kyle Hendricks. The Cubs also traded for All-Star closer, Wade Davis. Davis should adequately replace the void of Aroldis Chapman who was lost to free agency. Wrigley Rooftop premium seating represents an alternative to traditional suites. Situated on the roof tops of buildings surrounding the outfield, Wrigley Rooftops are quickly becoming an iconic way to experience a Cubs game. Wrigley Rooftop options includes club space, catering, private restrooms and bleacher seating. The Chicago Cubs are one of the most talked about teams in 2016. After reaching the NLCS in 2015, the Cubs hope are hoping to go deeper into October. They finished third in the NL Central but are the favorites to win the division this year. Manager Joe Maddon has a lineup filled with young talent. It starts with last year’s Rookie of the Year, Kris Bryant. Bryant will bat in the middle of the order and supply a ton of power for the Cubs for years to come. Next is outfielder Kyle Schwarber who joined the club midseason a year ago. Schwarber wasted no time hitting balls out of Wrigley Field. Jorge Soler is another power hitting outfielder and shortstop Addison Russell looks to be something special up the middle. To help these future stars develop, the Cubs have surrounded them with key veterans. Anthony Rizzo led the Cubs in just about every offensive category. They signed top free agent, Jason Heyward and utility man, Ben Zobrist. Heyward is one of the best defensive players in the league while Zobrist can play just about every position. The pitching staff will be led by two aces, Jake Arrieta and Jon Lester. Arrieta won the Cy Young Award last season. Behind these arms are John Lackey, Jason Hammel and Kyle Hendricks. Lackey is another edition is enjoyed a fantastic season with the Cardinals last year. While the starting rotation is strong with Arrieta and Lester at the top, their bullpen could be the only weakness. Closer Hector Rondon was inconsistent last year but was solid down the stretch. Considered to be one of the most legendary venues in all of sports, Wrigley Field is home to the Chicago Cubs. Whether you’re treating valued clients or going to the game with friends and family, Wrigley Field comes nothing short of a fun experience. Luxury suites include in-suite catering options, climate controlled indoor space, HDTV and a dedicated suite attendant. Your luxury box allows guests to enjoy comfortable seating both inside and outside your suite. Another option to entertain guests at Wrigley is on a Wrigley Rooftop. Wrigley Rooftop options also includes catering, private restrooms and bleacher seating. It’s no secret in Major League Baseball that the Chicago Cubs have been planning for the future. In 2015, Cubs fans may finally see their team turn things around and compete for the National League Central. During the offseason, the Cubs made a huge splash by signing one of the top free agents available in pitcher Jon Lester. They also added a new Manager, Joe Madden who was with the Tampa Bay Rays. The Cubs will feature some of the best prospects in baseball in 2015 such as Javier Baez, Arismendy Alcantara, Jorge Soler and Kris Bryant. They will continue to lean on their stars Anthony Rizzo and Starlin Castro for stability in their lineup. They added a new catcher, Miguel Montero from the Arizona Diamondbacks who will be an upgrade offensively for the Cubs. The Cubs will bring in a good a pitching staff with an offense they hope will get them at least 80 wins this year. With so much young talent, the Cubs will be patient and continue to look past 2015. 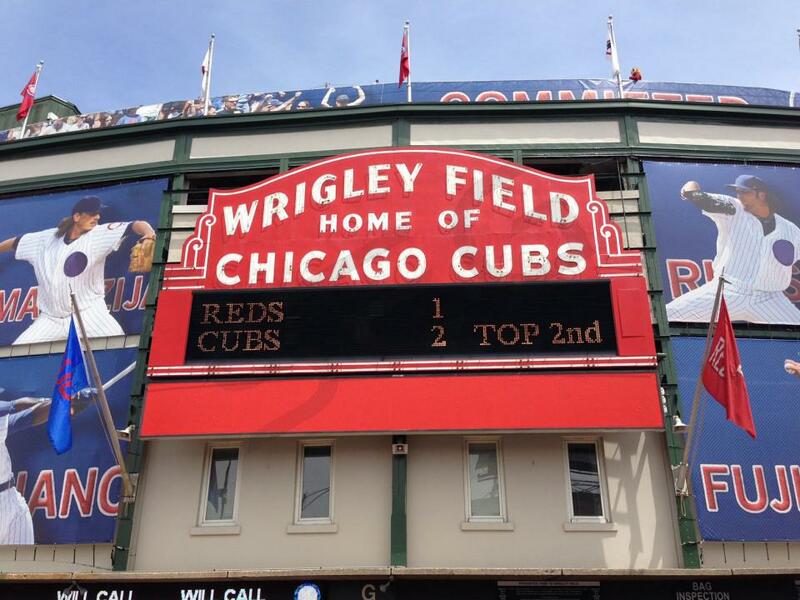 Considered to be one of the most legendary venues in all of sports, Wrigley Field is home to the Chicago Cubs. Whether you’re treating valued clients or going to the game with friends and family, Wrigley Field comes nothing short of a fun experience. Luxury suites include in-suite catering options, climate controlled indoor space, HDTV and a dedicated suite attendant. Your luxury box allows guests to enjoy comfortable seating both inside and outside your suite. Thank you for signing up for specials at Wrigley Field. Enter your email address below to stay in touch. We'll sign you up for our newsletter, which will inform you of the latest inventory and events at Wrigley Field. We promise we will never sell or distribute your information. 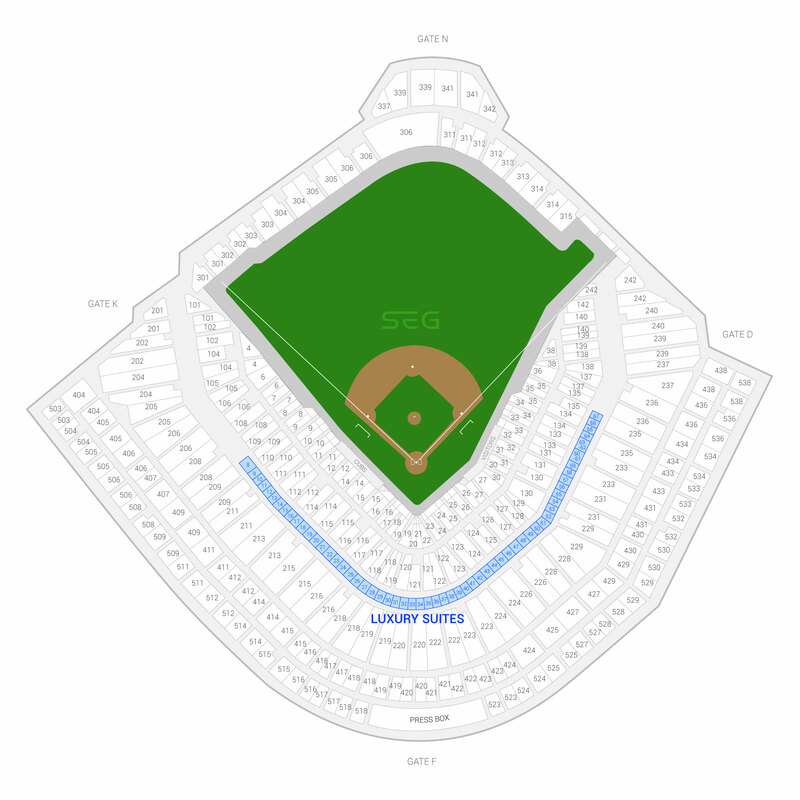 The seating chart below shows where the Chicago Cubs suites at Wrigley Field are located.